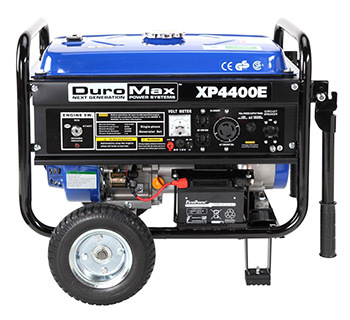 The DuroMax XP 4400E is among the top portable generators when it comes to value for money for every watt generated. In this DuroMax XP4400E portable generator review, we will discuss the generator’s key features in details, it’s specs, what we didn’t like about the machine, and lastly our overall view. DuroMax generators have been around for some time now. Built in the latest technology, with the needs of the modern generation in mind. Their generators are powerful that incorporate lots of amazing features making them easy to use and operate. With enough service centers located across the country, their customers have easy access to professional services for their machines. The price for their generators is quite affordable as well. They are built to be mobile and portable, and this is why most of their generators have wheels and adjustable handles. This is still the case with the new DuroMax XP4400E gas powered portable generator, that packs enough power for household, work, and recreational power needs. While at the same time being portable, and easy to carry from place to place. 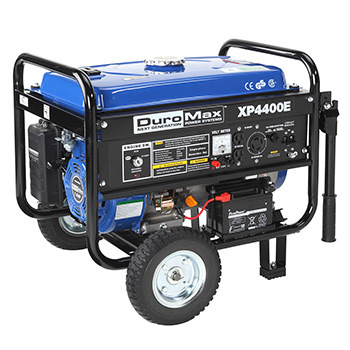 The DuroMax XP4400E generator, produces 3500 watts of running power, with starting wattage of 4400 watts. This makes it powerful enough for your household, and recreational purposes. It can effectively power up heavy-duty appliances in your home, or recreational vehicles such the 13500 BTU AC. You can also use it at a job site to run power tools such as drills, and saws. It has a large fuel tank, with a capacity of 4 gallons. The run-time of this generator is 8 hours on half of its maximum rated load on a full tank of fuel. Has a 7.0 horsepower 4-stroke OHV engine. The air-cooling feature available in it prevents the engine from heating up excessively. It has a super quiet muffler. Its noise level is rated at 69dB when the generator is operating in full-throttle mode. Easy to use with the various meters and control buttons on the side. Armed with a voltmeter as well, and this way you are able to monitor the output range of the generator when running. Flexible in its outlets, it is able to generate both, 120 volts and 240 volts of power. It uses a voltage selector (DuroMax RV Switch) to switch, and alternate between these two power modes. Equipped with circuit breakers, as well. Has several outlets for convenient operation, with two 120 volts, 20 Amp outlets, and a 120/240 volts 30 Amp outlet for use with heavy-duty appliances. There is a 12 volt DC outlet as well. A low oil shutdown feature prevents generator damage as a result of running on little or no oil. Starting it is very easy with its electric, and manual start options. Portable with its flip-up handle, and wheels. 69 decibel of noise can get quite irritating especially on a camping site. Oil spills out of the engine during shipment. You may be required to clean the machine before you get to use it. The tools provided by the manufacturer are insufficient. The one year warranty period is too low. The wheel kit instructions offered by the manufacturer are difficult to follow. Performance issues when the load increases past the 3000-watt mark. Not CARB compliant. Residents in California can, therefore, not acquire this generator. The DuroMax XP4400E portable generator is a powerful generator that can be used to supply power in many situations. At 4400 watts starting power, and 3500 watts running power. It is able to power your home in the event of an outage, serve as an outdoor generator for RV camping to power the air conditioner, and power your construction tools at the job site. It’s powerful enough for farms, and cottages as well. You can find the user manual through this link. However, it is not as quiet as other generators in the market, but the amount of power it delivers makes up for its noisy nature. At 120 pounds, it is somehow bulky. but the presence of wheels and an adjustable handle makes it quite portable, and easy to move around. As long as you can figure out how to install the wheels from the provided manual, then you will have no problem. Overall, the DuroMax XP4400E is an affordable source of power that meets the needs of the modern household, camper, and construction worker. If you have any questions we couldn’t make clear in the DuroMax XP 4400E portable generator review, please write us your questions in the comments section below. 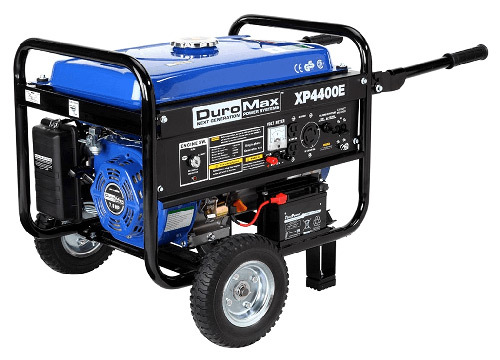 The DuroMax XP4400E Gas Powered Portable Generator is an affordable source of power that meets the needs of the modern households, campers, and construction workers. The XP 4400E by DuroMax seemed like a good buy until after a year and a half the engine dropped a valve and locked up. With a one year warranty I decided to open up the engine and found that the exhaust valve had dropped and punched a hole right through the piston. In my opinion since it did this with less than 5 hours on the generator engine. It should have lasted longer than it did if it was a well made Generator Engine.